This pair of cut resistant gloves is designed to prevent cutting hands when working with sharp items. It is important to have a pair of protective gloves to maintain safety during your work. It is so strong proven to be a Level 5 cut protection rating. It&apos;s perfect for cutting, working with knives, cutters, graters and peelers in the kitchen, woodworking, carving, carpentry and so much more. 13-gauge HPPE glass fiber lining provides good performance of cutting protection. Meet standard EN388, level 5 cut resistance standard, protecting your hands from scrapes and cuts. 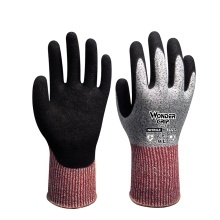 Unique nitrile rubber double-coated and Premium Finish, good grip and abrasion proof. Relaxed ergonomic design for great comfort and flexibility, effectively reducing hand fatigue. The best cut resistant gloves for a variety of situations. Suitable for working with knives, cutters, graters and peelers, woodworking, carving, carpentry and so much more. Due to manual measurement, 1-2cm error is allowed, please in kind prevail. Please measure your actual hand circumference before buying.